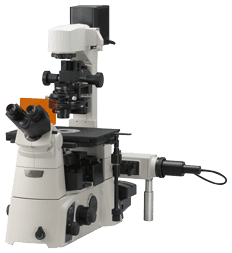 Inverted Microscope Eclipse Ti-U | EINST Technology Pte Ltd.
NIKON Universal inverted microscope that can be configured for use with motorized components. The Eclipse Ti-U inverted research microscope from Nikon is our universal model that can be configured for use with additional motorised components allowing you to build up a microscope to meet many of today’s demanding microscopy techniques. The Ti-U comes in a choice of two models with a standard three port model or expanded four port model which gives you access to a bottom port when your application demands you capture every single photon. The Eclipse Ti-U uses Nikon’s world-famous CFI60 optical system and a wide choice of objectives for bright field, dark field, fluorescence, phase contrast, DIC and modulation contrast microscopy techniques. High-speed Motorized Control and AcquisitionThe operational speeds of motorized components such as the nosepiece, fluorescence filters and stage have been greatly enhanced, allowing high-speed screening image capture during multi-dimensional experiments. Faster device movement and image acquisition reduce overall light exposure and subsequent photo-toxicity, leading to more meaningful data. The digital Controller Hub significantly increases motorized accessory speed by reducing communication overhead time between components, boosting total operation speed. The revolutionary external phase contrast unit enables the use of high N.A. non-phase contrast objective lenses for phase contrast imaging by the use of an external phase ring. As this external phase ring is not in the epi-fluorescence light path, users can capture both fluorescence images as well as phase contrast images without compromising on fluorescence tranmission. Nikon’s comprehensive imaging software NIS-Elements provides an integrated control of the microscope, cameras, components and peripherals. The intuitive GUI and efficient workflow make the programming of automated imaging sequences up to 6D (X, Y, Z, time, wavelength, multipoint) easy to perform. Taking advantage of the Nikon Ti’s stratum structure, modules can be incorporated as two separate layers with multiple modules per layer. Using a dual layer configuration enables optimal filter configuration for each illumination module. This enables optimal filter selection and improves experimental accuracy whilst maintaining the highest acquisition speeds. The Ti-U has two built-in imaging ports* that can be dedicated to specific tasks, offering a flexible configuration at a high cost-to-performance ratio.